This section explains flow of information between client and Amazon Lex in which the client uses the PostText API to send requests. For more information, see PostText. 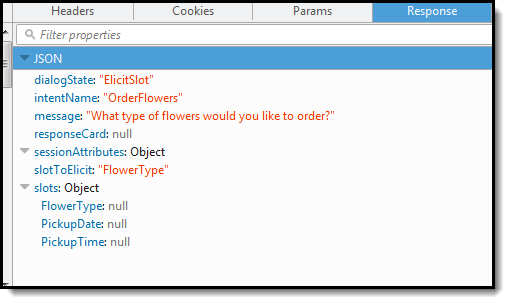 From the inputText, Amazon Lex detects the intent (OrderFlowers). This intent does not have any code hooks (that is, the Lambda functions) for initialization and validation of user input or fulfillment. Amazon Lex chooses one of the intent's slots (FlowerType) to elicit the value. It also selects one of the value-elicitation prompts for the slot (all part of the intent configuration), and then sends the following response back to the client. The console displays the message in the response to the user. The inputText in the request body provides user input. The sessionAttributes remains empty. Amazon Lex first interprets the inputText in the context of the current intent—the service remembers that it had asked the specific user for information about the FlowerType slot. 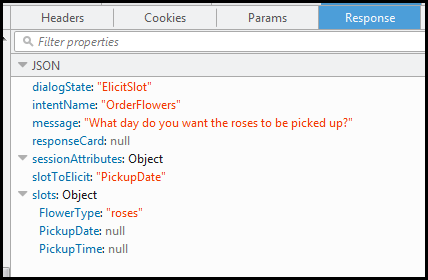 Amazon Lex first updates the slot value for the current intent and chooses another slot (PickupDate) along with one of its prompt messages—What day do you want the roses to be picked up?— for the slot. Amazon Lex first interprets the inputText in the context of the current intent—the service remembers that it had asked the specific user for information about the PickupDate slot. Amazon Lex updates the slot (PickupDate) value for the current intent. It chooses another slot to elicit value for (PickupTime). It returns one of the value-elicitation prompts—Deliver the roses at what time on 2017-01-01?—to the client. Amazon Lex first interprets the inputText in the context of the current intent—the service remembers that it had asked the specific user for information about the PickupTime slot. Amazon Lex first updates the slot value for the current intent. Now Amazon Lex detects that it has information for all the slots. Amazon Lex interprets the inputText in the context of confirming the current intent. It understands that the user want to proceed with the order. 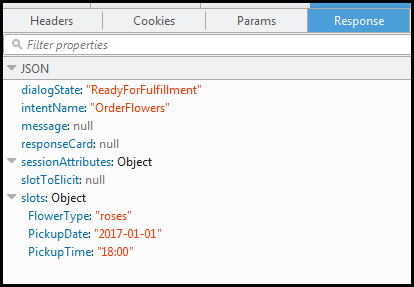 The OrderFlowers intent is configured with ReturnIntent as the fulfillment activity (there is no Lambda function to fulfill the intent). Therefore, Amazon Lex returns the slot data to the client. Amazon Lex set the dialogState to ReadyForFulfillment. The client can then fulfill the intent. The Lambda function validates slot data after every user input. It fulfills the intent at the end. 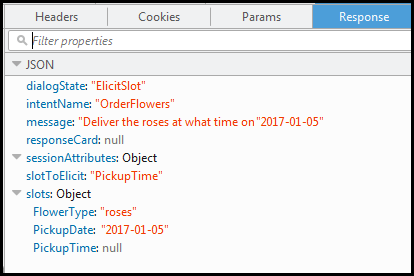 That is, the bot processes the flowers order and returns a message to the user instead of simply returning slot data to the client. For more information, see Using Lambda Functions. The Lambda function also sets the session attributes. For more information about session attributes, see PostText. After you complete the Getting Started section, you can do the additional exercises (Additional Examples: Creating Amazon Lex Bots ). Example Bot: BookTrip uses session attributes to share cross-intent information to engage in a dynamic conversation with the user.